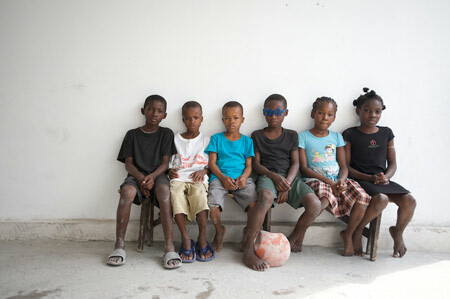 This time last year, it was hard to escape headlines about Haitian orphans. In the post-earthquake chaos, some American Baptists got arrested for trying to move 33 kids out of the country without proper paperwork—White People Stealing Haitian Babies! Now there’s a lot less news about the orphanages. But there’s still a lot more to be done for the kids who lost their families—not to mention the 380,000 or so who were orphaned even before the quake struck. 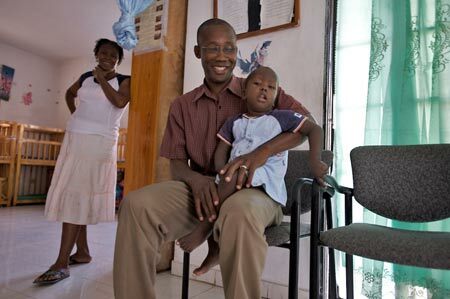 At the Foyer de la Patience des Enfants de Favorises orphanage in Port-au-Prince, the biggest problem caretaker Frantz Joseph has with foreigners coming in to take kids is that not enough of them are doing it. The two-room cement block building houses 50 kids, many of them the children of earthquake victims, ranging in age from infants to grade-schoolers. One of them, a boy named Walkeson, wearing a dirty jersey, shuffles over to us. “He has cholera,” Joseph says. “He’s getting better.” They took him to the hospital for treatment—but not before he infected six other kids. The others are still in the hospital. “You cannot get food or donations without connections,” Joseph says. He has just a few revolving staff members, who always leave because he can’t pay them. The orphanage has been scraping by for four years. “I don’t have money to buy shoes, to buy shirts for the kids,” Joseph says. An NGO gives them food. At night, the staff drags mattresses out of a storage room onto the floor so the kids can sleep. Literally across the street, at Foyer de Sion orphanage director Guesno Mardy, the benefits of connections are on full display. We drop by unannounced and without an appointment, and in here it’s like a party, all Transformers curtains and stuffed animals and shiny tile floors. The two-story house holds 45 kids attended to by 20 staff members. Downstairs, a bunch of cribs and smiling babies. Upstairs, older kids sit around a table in front of a tutor, who erupt into song when they see Mark and me. Bonjour, salut, something about friendship. They’re all wearing matching bright-green T-shirts with corporate logos on them, like a cycling team. 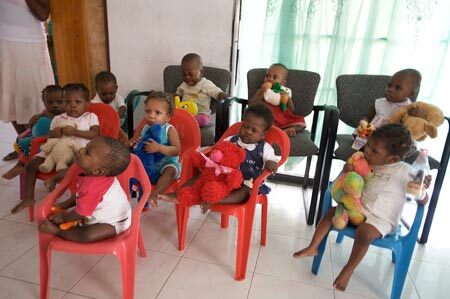 Toddlers sit for a class portrait at the Foyer de Sion orphanage in Port-au-Prince. “We get funding from Voila,” a cell phone company, explains director Guesno Mardy. The orphanage is also funded by a board of directors founded by an American woman. The Americans solicit donations from their friends, and send checks and food of their own. Soon, the orphanage will move to a bigger house. So what are the country’s orphanages going to do about finding new families for their wards?